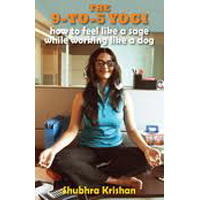 This is a very simple book, which uses a fictitious character called Uma, who’s a stressed-out, over-worked corporate professional, who regains control of her life through the author’s timely intervention. The author hand holds Uma through the basic principles of Ayurveda. First, she takes Uma to a vaidya, of whom she’s a bit sceptical in the beginning, but gradually starts to respect for decoding her with just a look & a touch. Chapter by chapter the author takes Uma (& the reader) through various simple practices like deep breathing, exercising, sipping more water instead of caffaine, bathing right, moisturising your skin, etc. She even has a chapter giving us her best-loved recipes full of taste and nourishment – chickpea salad, yellow dal, rice keer.. all simple, but delicious. She’s of the opinion that going to an allopathic doctor is a bit like going to the mall & get a ready-made dress. They’re basically divided into small, medium & large & you take your pick. But it is you who know your body intimately. You’ve been living in it for so many years. It gives you signals when something is wrong. So why go to somebody who can only look at it from outside and at best can only guess and use his/her intuition to treat you? But this is definitely not just a handbook on ayurveda… Though simply written peppered with a lot of “oohs !” & “aahs!” from Uma (which I personally found annoying), the book is a very sensible read. Its only when I read it for the second time, did I fully grasp the principal mantra behind the book. It is a very profound mantra these days, because we subject our own selves to enormous stress caused by pressures at work, home, family, friends,& generally run around like a car without a driver. This book like any good self-help book, puts you back on the driver’s seat & teaches you to take charge! In essence, the very simplicity of this book is its greatest strength.